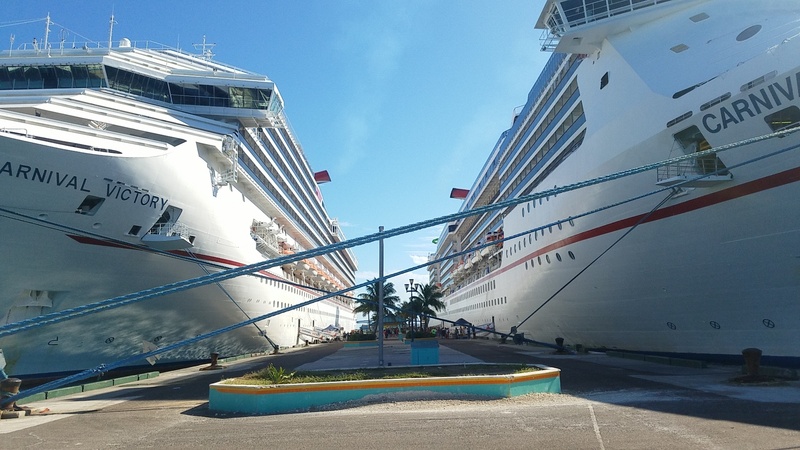 Carnival Pride is taller than Nassau, the capital city of the Bahamas. This trip was my first time really spending time on islands, rather than the mainland, and I’m not sure whether I was fully prepared for how small they really are. Looking at the harbor from the battlement atop Fort Fincastle, I was suddenly struck by how safe such a simple building could be. Sitting atop the highest point on the island of New Providence, Ft. Fincastle is a Colonial-era stronghold built by slaves for an angry, paranoid Scottish man in his latter years. Formerly, Lord Dunmore had been royal governor of New York, then of Virginia, where he successfully expanded the Virginia province to reach from the Atlantic to the Ohio River (modern-day West Virginia’s northwestern border). However, his chronic ineptness came to a head in 1776, when he accidentally burned down Norfolk while attempting to defend it from American Revolutionaries. He took the cue and fled—ultimately back across the Atlantic. He kept cashing the checks the Crown sent him for governing Virginia until 1783, at which point the British government conceded that the United States of America might actually count as a country now. I can’t tell if the Crown didn’t notice the embezzlement or just didn’t care, but four years later, Lord Dunmore was appointed Royal Governor of the Bahamas. Loaded with cash and sour at his failings in government nt, he did the one logical thing: built a fort at the apex of New Providence to defend against the impending British attack (that never actually happened). Not just any fort, either: a perfect coward’s fort. Cannons and walls, yes, but any coward’s fort worth its salt has secret exits and ridiculous tunnels. It seems as though nobody argued with Lord Dunmore in the Bahamas. Perhaps he never made his true intentions public information, but nobody stopped him from seeing the work he had decided upon through. Using the slaves sent with him to fuel the colony, the fort went up, and a path was cut directly from the fort to the city, hewn by hand from the limestone. By hand, not because of any shortage of tools, but because slaves so outnumbered free men on the island that shovels and picks would be enough to facilitate a successful rebellion. Certainly, at least, in Dunmore’s mind. Thus, the work was all done by hammer and chisel. The chasm would ultimately reach three stories deep, with sixty-six stone steps leading to the top of the hill and the entrance to the fort. It wasn’t enough, though. Lord Dunmore ordered a tunnel be dug from the foot of the steps to his quarters. And so it was; the entrance to the tunnel remains to this day. All told, it would cost the lives of five thousand slaves, including women and children. Chisel marks remain on the walls, stark images of the hands that carved them. There are no burial sites on the island. No mass graves have been found, but the tunnel was sealed when the fort went out of commission. It is the common belief of the native Bahamians—descendants of those slaves given chisels—that the dead are buried in that tunnel system. In that way, the tunnel(s) have become an ancestral crypt, and no effort has been made to excavate them for that reason. The sixty-six steps have been named The Queen’s Staircase in honor of Queen Victoria’s efforts toward the abolition of slavery. taircase itself is long and imposing; I’m not sure if it’s because the steps are hewn from stone or carved by slaves, but reaching the top seems far more difficult than climbing three stories in a stairwell. At the top, an asphalt road comes right up in a loop past the Staircase and the fort itself, and several souvenir stalls are set up on either side of the road. A guide is posted in the fort as well, where they charge admission. Standing atop the battlement, I could plainly see Carnival Pride docked at Nassau’s port, and her giant iconic smoke stack went higher than my head. Distances mean different things on an island, or on a ship, and in a way it’s baffling. Life shifts to fit the space it’s given; I come from a town off the highway connecting New York City and Washington D.C., with stops at Philadelphia, Wilmington, and Baltimore on the way. The guide posted at the mouth of the chasm waved at locals walking by, calling them nicknames and exchanging quick jokes. He was friendly, and posted there by the government to tell this story. He didn’t force anyone to stop and listen, but only those who did would go on to look at those walls and understand them. There is a dimension added to the experience when a story like this is told by the people whose lives it’s become. An experience magnified by the dearth of information on these places available online. I had no excursion planned for Nassau, but my field trip to Fort Fincastle will remain one of the best experiences I had in the Bahamas, without a doubt. Thanks, definitely worth reading (going to Nassau in April) and sorry I left the thin sliver of paper behind tonight at McGlynns! So glad you found your way anyway!